This should have been posted on Thursday! Beautiful song and beautifully sung by Angelina. ...free Adult Catholic Correspondence Course - A home study course on the teachings of the Catholic Church and Faith Formation. A funeral Mass for Fr. Duffy is scheduled on Friday, April 3rd, at 10 a.m., St. Pius X Parish, Manoa. Details will be forthcoming. Fr. Duffy was born in Brooklyn, New York, on September 11, 1909. He was ordained a priest on February 2, 1961 at Our Lady of Angels Church in Brooklyn, New York by Bishop Broderick of the Diocese of Brooklyn. After his ordination, Fr. 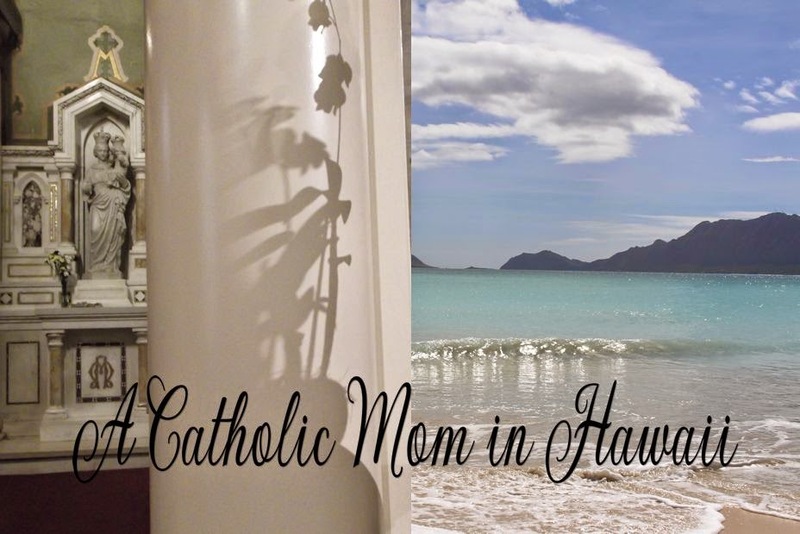 Duffy traveled to the new State of Hawaii and spent three years working at Our Lady of Peace Cathedral of Honolulu. From 1964 – 1967, he was the personal secretary to Bishop James J. Sweeney, Hawaii’s first bishop, followed by three months as an associate pastor at Our Lady of Good Counsel Church in Pearl City. In 1968, Fr. 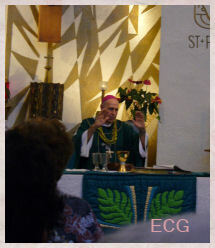 Duffy was named Associate Pastor, and then a year later, pastor, of St. Pius X Church in Manoa, a post he held for 16 years, until his retirement in 1984. In the years since his retirement, Fr. Duffy has kept active in the diocese as an advisor and as a regular columnist in the Hawaii Catholic Herald. He was instrumental in the establishment of Malulani Hale, a church-sponsored low-cost housing project for the elderly in Honolulu. Please join with me in praying for the repose of his soul and in thanksgiving for his priestly services to our Church. I have been wracking my simple mind lately about how to restrain my love of comforts. I simply love comfort - my comfortable bed, favorite foods, good wine, computer games...you name it I seek it if its comfortable. Trouble with this is, is hampers all my small efforts to grow in virtue. I have become a slave to my own desires for comfort and therefore am mired in this world. I am unsure if I even have the will to try to give up my comforts but turn instead to prayer asking and begging God to help me at least want to mortify my desires and senses. I came across this reading and plan to meditate upon it. I thought perhaps others may find it helpful as well. "There is an old principle which goes: "Da mihi sanguinem et dabo tibi spiritum." Woe to those who are enemies of mortification and of the cross of Christ! 6. If he intends by mortification to receive greater light to know the divine attributes, it will be an act of faith. 7. If he does it for the purpose of making his salvation more and more secure, it will be an act of hope. Virtue has so much more merit, is more resplendent, charming and attractive, when accompanied by greater sacrifice. Man, who is vile, weak, mean, cowardly, never makes a sacrifice, and is not even capable of doing so, for he never resists even one appetite or desire. Everything that his concupiscence and passions demand, he concedes, if it is in his power to yield or reject, for he is base and cowardly, and lets himself be conquered and completely overcome, just as the braver of two fighters conquers the cowardly one. So it is with vice and the vicious -- the latter is crushed and the slave of his vices. Continence and chastity are therefore worthy of the highest praise, because the man who practices purity refrains from the pleasure which proceeds from nature or passion. Thus, the greater merit will be his the greater the pleasure he has denied himself. His merit will be the greater in proportion to the amount of repugnance he will have in conquering himself, in proportion to the intense and prolonged suffering he will have to undergo, to the human respect he will have to vanquish, and to the sacrifices he will have to make. Let him do all this and suffer all for the love of virtue and for God's greater glory. As to my exterior deportment, I proposed to myself modesty and recollection and in the interior of my soul my aim was continual and ardent occupation in God. In my work I aimed at patience, silence and suffering. The exact accomplishment of the law of God and of the Church, the obligations of my state of life as prescribed by God. I tried to do good to others, flee from sin, faults and imperfections, and to practice virtue." I do not feel that I have been doing much fasting, praying or almsgiving this Lent. Part of my problem is well, I am human and am weak in nature. I am not excusing myself though. I feel that with a little more prayer and fasting, I would be growing spiritually this Lent. Instead, it's been one battle after another with temptations, relationship misunderstandings and pride, among other misgivings, that come up which cause me to forget my resolutions this Lent. Well, when I feel at my weakest spiritually, I pray from the heart. I don't actually pray my formal prayers, I really find myself beseeching God to help me. And, God answers my plea. With His guidance, I found an article written by Fr. John Hardon on the topic of Penance and reparation. Reading what Father Hardon has to teach us about penance and reparation for my sins and other sins that offend God, was what I needed to help me with the remainder of Lent. Penance and reparation are the consequence of sin. Or again, penance and reparation are the price we have to pay for our own and other people's sin. Penance and reparation, finally, are what God requires from sinners as a condition for showing them His mercy. - First: we incur guilt before God for the self-will that caused us to sin. We become more or less separated or estranged from God, depending on the gravity of our sin. - Second: We deserve punishment for the disorder we cause by our sinful conduct. We become liable to suffering pain, again more or less pain, depending on how seriously we have done wrong. Against this background, we can more easily see the meaning of penance and reparation. - Penance is the repentance we must make to remove the guilt, or to reinstate ourselves in God's friendship. - Reparation is the pain we must endure to make up for the harm we brought about by our self-indulgence when we sinned. What then do penance and reparation have in common? They have this in common, that they are absolutely necessary if the justice of God is to be satisfied after we have offended the divine Majesty. They also have this in common, that God now has a right to demand more of us than He would have required had we not committed sin. The word more is basic to any correct understanding of penance and reparation. But if penance and reparation have this in common, how do they differ? They differ, as we have seen, in the two different ways that we do wrong whenever we sin. Because we have failed in loving God, we now owe Him more love than He would have required had we not offended Him. We did wrong by our willful love of self. So now we have to make up by our selfless love of God. This is Penance. And because we have brought disorder into the world by our sins, we must undergo pain to undo this harm we have caused. This is reparation. 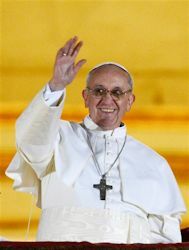 God is merciful and in fact as our Holy Father has told us, Jesus Christ is the Incarnation of divine mercy. But God's mercy is conditional. It is conditional on our practice of penance and reparation. We come to the third and, in a way, most important part of our subject: How? I say it is the most important because we could talk for hours about the theology of penance and reparation and end up, wiser perhaps, but not holier. We must take the next and final step, and ask ourselves, practically, what am to do about it? 3. And forgive! - for penance, to make up for our failure in loving God. 7. And sacrifice! - in reparation for the punishment that we and others have deserved for our sins. 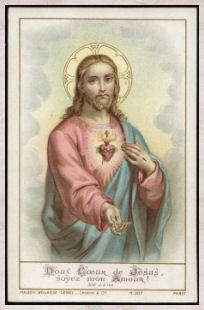 Suppose we spend a moment on each of these seven rules, and ask Our Lord, to open our hearts to respond with generosity to His offended Sacred Heart. God expects more of us because we have sinned. And the first more that all of us can put into practice, is more prayer. - Call it giving more time each day to prayer. - Call it attending Mass more often. 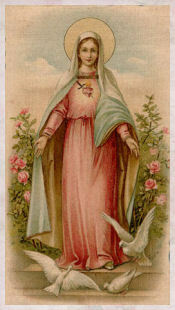 - Call it reciting the Rosary more frequently. - Call it being more attentive when we pray. - Call it more fervor in our life of prayer. - Call it getting more people to join us when we pray. - No matter, the first rule of salutary penance is more prayer. Remember what Christ told us the night before He died. "A new commandment I give to you, that you love one another as I have loved you." If all sin is a failure in loving God, and we mainly show our love for God by loving one another, then we had better show our love for others by sharing with them what God has given to us. Again the word more comes in. 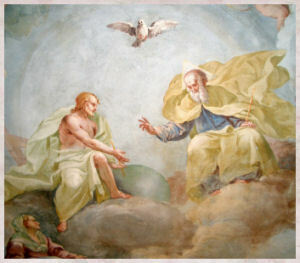 We are to examine our conscience and ask ourselves, what more can I share with those whom God has placed into my life? - Can I give more of my time to others? - Can I share more of my knowledge with others? - Can I share more of my skill with others? - Can I share more of my money with others? - Can I share more of my Catholic faith with others? Each of us is different in this matter of sharing because each of us is living a different life with different people whom God's Providence places in our path. The second rule for the practice of penance is more sharing. Christ could not have been more explicit in urging us to forgive others who offend us. He gave us whole parables on the subject of forgiveness. He warned us that God will be as merciful to us as we are forgiving to others. He placed, in the center of The Lord's Prayer, a frightening invocation, "Forgive us our trespasses as we forgive those who trespass against us." Once again, it behooves us to look to our practice of forgiveness of injuries, so to be more forgiving in the future than we have been in the past. - Can I be more forgiving by forgetting what others have done to me? - Can I be more forgiving by ignoring the unkindness and thoughtlessness and perhaps meanness that others commit against me? No two of us are living the same lives. Each of us have different people saying or doing or failing to say or do things that hurt us and, perhaps, crush the very heart of our souls. The third rule of penance is to be more forgiving. We now shift from penance to reparation, and our first directive is to work. How is work a form of reparation of sin? It is reparation because our fallen human nature dislikes to exert itself. Work is a form of mortification that all of us can look to see whether we could not work harder than we are doing - in performance of tasks that are part of our state in life. By nature we are prone to first do what we like, then what is useful, and finally, what is necessary. I cannot think of a more effective kind of reparation than to set our minds to reversing that order. We should first do what is necessary, then what is useful, and only then what is pleasant or what we like. 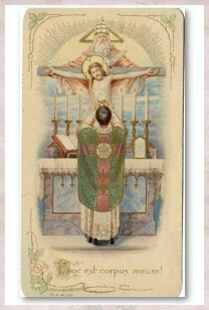 In some ways this is the keystone of reparation, the patient endurance of the sufferings and trials that God sends us. God in His mercy sends us the Cross in order to try our patience that we might save our souls and the souls of many others besides. The variety of these trials sent us by God defies classification and their intensity depends on a thousand factors that differ with different people. If we are to expiate sin we must resign ourselves to endure pain. But, as we know, there are degrees and degrees to this resignation. - Can we accept misunderstanding from others with greater peace of mind? - Can we be more generous in doing what we know God wants us to do, although doing it is painful? - Can we suffer without pitying ourselves? - Can we put up with discomfort, or distaste, or disability, without becoming bitter about what we are tempted to consider injustice on the part of God? Yes, God's violations are blessings, and the crosses He sends us are tokens of His love. But how we need the light of faith to see this, and the strength of His grace to do this -- in reparation for sin, as the price we must pay to reach heaven, where every tear will be wiped away and all the past, which is now the present, will have passed away. Our sixth rule is to practice reparation by depriving ourselves of something we now have that we could, if we wanted to, do without. - Or some trinket, or adult toy that we could just as well do without. Call it mortification or self-denial; whatever the name, the basic idea is to expiate for sins of self-indulgence by giving up. When we sin we offend God by choosing some creature to which we have no right. When we practice mortification, we make reparation by choosing to deprive ourselves of some creature we have a right to -- why, in order to undo the harm caused by sin and thus propitiate the offended justice of God. I have saved sacrifice for the end because it synthesizes everything we have so far said. - What is sacrifice? Sacrifice is the surrender of something to God. - Sacrifice is the heart of penance and reparation. When we sacrifice, we let go with our wills of whatever we could legitimately possess and enjoy because we want to make up to God for having stupidly chosen some creature in preference to the Creator. We return to where we began by stressing that when we sacrifice, we do more than we would have done; we give up more than we would have given up; we surrender more of what we like in order to -- in plain English -- prove to God that we love Him. There is an episode in the Gospels that perfectly synthesizes this cardinal mystery of sin and penitential reparation. Remember after the Resurrection when Christ asked Peter, "Simon, son of John, do you love me more than the others do?" Why the question? Because Peter had sinned; sinned more than the others who had remained faithful to the Master. Peter was expected to love Christ more. Why more? Because he had more to sacrifice in order to expiate more because he had so deeply sinned in denying the Saviour. As we look into our hearts we must humbly confess that truly, we have sinned, sinned often, sinned deeply, sinned willfully. But God is good. He gives us the privilege of not only expiating what we have done wrong, but actually becoming more pleasing to Him by our penance and reparation. It was no pious statement that St. Paul gave us when he said, "Where sin abounded, grace has even more abounded." In other words, in God's providence, He allows us to sin so we might repent and become saints. 994 'My enthusiasm is gone', you write. You have to work not out of enthusiasm but out of Love: conscious of duty, which means self-denial. 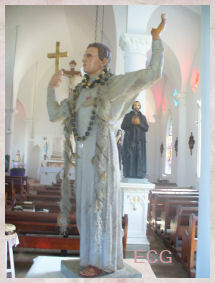 Father Edwin Joseph. Duffy R.I.P. "How are the mosquitas in New Joisey"? I am sure going to miss Fr. Duffy asking me that every year when I returned from New Jersey. Our good friend and homeschooling spiritual director passed away last evening. 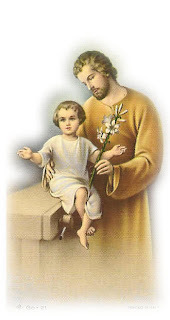 God called his faithful servant home on the feast day of St. Joseph, the patron saint of the departing souls. It was indeed a blessing that I along with many of his friends, including my old homeschooling group, were able to visit with Father Duffy yesterday and bid our aloha. 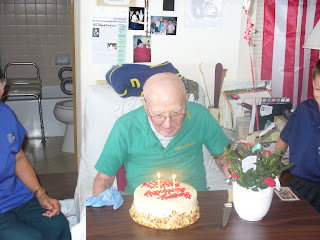 Father will be remembered for his Irish wit, his humor and most of all his love of the Catholic faith...of the priesthood. He was always encouraging the boys in our homeschooling group to become a priest. He even called my son "Pope Joey" and that is the name everyone in Fr. Duffy's circle of friends knew him as. He was also a good confessor and spiritual director to many people. He was one of two priests who could make me laugh out loud literally, during Confession. Yet, I knew I had made a good confession with his gently promptings and guidance. It didn't matter where you were when you need to go to confession. Father Duffy would always be happy to hear your confession. Many times, after picking Father up, Father Duffy would hear my confession, in the car before driving off to a homeschool meeting. He had a late vocation. 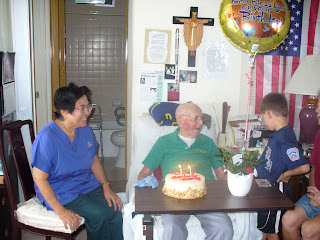 He had a career as a businessman and then the army before entering the Blessed John XXIII Seminary. He was originally from Brooklyn, which explains why he referred to my home state as New Joisey, and was he proud of that! He never did forgive the Dodgers for moving to L.A., even though he did continue to watch them. There is just so much to share with all of you about this very holy priest who helped bring so many people into the Church. He wrote a few books based on his popular Father Duffy's Reflections which appeared regularly in the Hawaii Catholic Herald. It always amused me how he was unfazed by the notables he knew. He had the privilege of riding in the car with Archbishop Fulton J. Sheen when Bishop Sheen visited the islands a long time ago. Instead of being impressed by this fact, Fr. Duffy wanted to know why the archbishop was so quiet. And, he didn't hesitate to ask. That was Father Duffy's point to the story he was telling. He also told me the story of how he had a really nice conversation with actor Richard Harris when he was here filming the movie Hawaii. A few months before Father Groeschel had that terrible accident, I had the opportunity to hear him speak. I also had a chance to say a few words to him. I mentioned I was from Hawaii. I don't know how Father Duffy popped into the conversation but he said "Tell Edwin, I said hello". I passed the message to Father Duffy who didn't seem at all surprised like I had been. 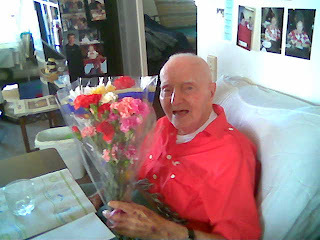 Father loved to hear jokes and he especially loved to tell them. One of his favorites was about a husband and wife were out driving in the car. They had been arguing. They pass a herd of swine. Husband remarks sarcastically, "Relatives of yours?" Yes, the wife replies "In-laws". Boy did he love this joke! Well, I know Father is happy now. He is with his beloved family and his good friends like Fr. Turk and Fr. Mark Consalves. Eternal rest grant unto him O Lord and may Your perpetual light shine upon him. 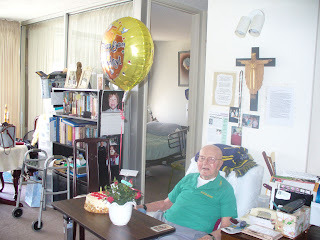 May Father Duffy rest in peace. 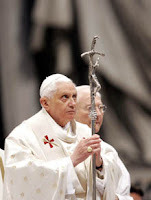 Pope Benedict XVI, who is noted for his revival of strikingly colourful traditional papal vestments, has urged Catholic priests to shun casual or scruffy attire and return to wearing smart outfits which clearly mark them out as clergy. Mahalo to my friend Lois for emailing me the article. the gateway to eternal life. he may come before you free from sin. and keep it ever safe under your patronage. What wonderful news on this Feast of St. Joseph! Feast of St. Joseph - Go to Joseph! Given the prominence of his name in the history and geography of Christian society, St. Joseph naturally arouses our attention and commends our respect. Since the feast of St. Joseph is celebrated on March 19 in the Church's liturgical calendar, March has traditionally been observed as the month of St. Joseph. May 1 we honor St. Joseph the Worker, a feast intended to highlight the dignity of every working person and the blessing of work as a means of improving the lives of all. These devotional observances remind us to recall the importance of Joseph's place in God's plan of salvation, and to renew our intercession for his assistance and protection. In reality the head of the Holy Family is a man for all seasons. Joseph of Nazareth shared like no other being except Mary in the mystery of the Incarnation, God becoming human. He was significantly involved in this sacred event of our salvation. Joseph was God's choice to be the husband of Mary and the guardian of Jesus. 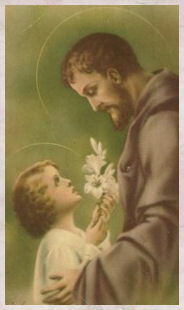 Little is known of St. Joseph. The infancy narratives in the Gospels of St. Matthew and St. Luke contain the only factual information about him in the Bible. Through Joseph's genealogy Jesus was heir to the Davidic promise. This established the Savior's Jewishness, his messianic character, his historic reality. Spiritually this indicates that Joseph shows us how we can receive the promised Savior, give him a place of dignity in our lives, offer him a family, and protect him. 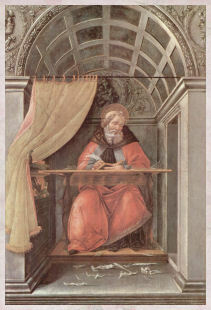 The Gospel identifies Joseph as a carpenter. The Greek expression of the Gospel, techton, refers to a worker in wood, someone who made articles needed for village life, either domestic use or outdoor work, like frames for small buildings, simple furniture, and plows. God manifested his will about the marriage of Joseph and Mary in a special way. Joseph was certainly not the physical father of Jesus. The virginal conception of the Savior was the cause of great anxiety for Joseph, but he was relieved of this upset by a mystical dream. Catholic theologians and Biblical scholars have shown that Mary's vow or promise of virginity was not incompatible with the Jewish mentality and practice of the time. The mystery of the Incarnation also exalted Joseph's virginity. In the second chapter of Luke's Gospel, Joseph is called a parent and father when the Temple mysteries are recorded. His fatherhood is restricted to a legal context since the Presentation and the Passover were legal obligations. Significantly he is not called father until the Child is born and the birth proclaimed by a heavenly sign. As Mary cooperated by faith and obedience, so did Joseph, who "did as the angel of the Lord commanded him." Since Joseph's death is not mentioned in the New Testament, Biblical scholars assume that he died before Jesus' public ministry, or before Jesus' passion and death. Otherwise why should Mary be entrusted to John? 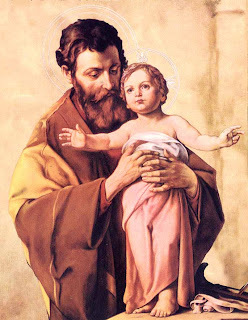 From the earliest centuries of Christianity, St. Augustine and other Fathers of the Church wrote of St. Joseph. But the theology of his vocation, dignity, holiness, and intercessory power began to flower in medieval times; and the seventeenth century was a golden age for the development of Josephology. The enthusiasm of St. Teresa of Avila for St. Joseph was remarkable, vividly expressed in her writings, and perpetuated in the twelve convents she founded in his honor. All the popes of modern times, from Blessed Pius IX in the nineteenth century until our present Holy Father have issued substantial teaching about St. Joseph in their official documents. Years before his passage to eternity Pope John Paul II added to this rich body of doctrine in 1989 with his inspirational letter, Guardian of the Redeemer (Redemptoris Custos). This instruction affords us another occasion to recall the importance of St. Joseph in God's plan of salvation and to review what makes him special, not only for us personally, but for the Universal Church. John Paul II's pastoral letter, an apostolic exhortation, deals with the person and mission of St. Joseph in the life of Christ and of the Church. 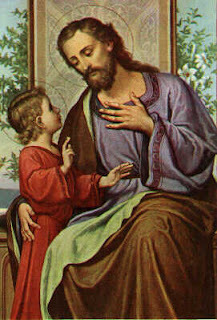 "Inspired by the Gospel, the Fathers of the Church from earliest times stressed that just as St. Joseph took loving care of Mary and gladly dedicated himself to Jesus Christ's upbringing, he likewise watches over and protects Christ's Mystical Body, the Church, of which the Virgin Mary is the exemplar and model." "On the centenary of Pope Leo XIII's encyclical letter Quamquam Pluries (1889) and in line with the veneration given to St. Joseph over the centuries, I wish to offer some…reflections concerning him to whose care God entrusted his most precious treasures." This John Paul II does in an instruction of several dozen pages with a brief chapter devoted to each of the following topics: the Gospel portrait of Joseph, Joseph as guardian of the mystery of God, Joseph as just man and husband, work as an expression of love, the primacy of the interior life, and Joseph as the patron of the Church in our day. Thus he continued in the example of his distinguished papal predecessors. By the decree Quemadmodum Deus (1870) Blessed Pius IX proclaimed Joseph Patron of the Church; and in his apostolic letter Inclytum Patriarcham he explained why and outlined a theology of Joseph. The sketch of Pius IX was developed by his successor in Quamqaum Pluries, and that encyclical letter of Leo XIII is the most important document on St. Joseph up to Custos Redemptoris of John Paul II. Pope St. Pius X (Joseph Sarto) acted pastorally by composing a prayer to his personal patron and by approving the Litany of St. Joseph. In 1920 Pope Benedict XV issued a motu proprio to honor the golden jubilee of the proclamation of Joseph's universal patronage of the Church. Pope Pius XI spoke often in his addresses of the merits, dignity, and power of St. Joseph, and invoked him as special protector against atheistic communism in the encyclical Divini Redemptoris (1937). Pope Pius XII instituted the feast of St. Joseph the Worker on May 1, 1955, and composed a prayer about this title. In his apostolic letter Le Voci (1961) Blessed John XXIII summarized the teachings of his predecessors and named St. Joseph "Protector of the Second Vatican Council." On his own initiative, during the first session of Vatican II, Pope John XXIII included Joseph's name in the Roman Canon (First Eucharistic Prayer) of the Mass. In a similar vein Pope Paul VI extolled Joseph in the life of the Church in his teachings. Now, in our day, Pope Benedict XVI (Joseph Ratzinger) continues in his teaching and preaching to follow in the footsteps of his predecessors to enhance the centuries-old appreciation of St. Joseph. And we can expect more. As a result of this honored tradition, the accommodated Biblical directive (Gn 41:55) still rings true for all God's people: "Go to Joseph!" Reprinted with permission. Mahalo Brother John! 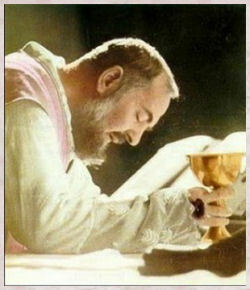 "Let us pour out our whole soul to God in prayer. God is captivated by our prayers and will come to our aid." "All prayers are good when they are accompanied by good intentions and good will." "Pray with perseverance, trust, and a serene and calm mind." Prayer is the best weapon we have; it is the key that opens God's heart." "Pray, hope and don't worry. Worry is useless. God is merciful and will hear your prayer." 317 What zeal people put into their earthly affairs: dreaming of honours, striving for riches, bent on sensuality. Men and women, rich and poor, old and middle— aged and young and even children: all of them the same. When you and I put the same zeal into the affairs of our souls, we will have a living and operative faith: and there will be no obstacle that we cannot overcome in our apostolic undertakings. In December of 2008, I read this post on Fr. Price. Philip kindly sent me a few prayer cards and I promised to pray for him daily. Father Price was born in Wilmington, North Carolina in 1860. He studied at St. Mary's Seminary in Baltimore and was ordained to the priesthood in 1886. Within a few years of ordination, Father Price, infused with a zeal for evangelism, took the teachings of the Catholic Church statewide. In 1899, he established an orphanage near Raleigh, and three years later began a preparatory school to train men for the North Carolina missions. In 1908, he began writing the Blessed Virgin Mary a daily letter, sharing with her the challenges and joys he encountered that day. 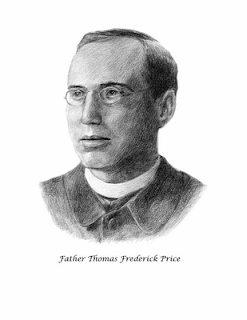 In 1911, Father Price's vision of spreading Catholicism was moving beyond the border of North Carolina. He joined with Father James A. Walsh in founding the American Catholic Foreign Mission Society, popularly known as Maryknoll. In 1918, Father Price accompanied the first three Maryknoll missionaries on their assignment to China. One year later, he died of a ruptured appendix. His heart was removed and buried in Nevers, France, near the body of St. Bernadette Soubirous, to whom he was extremely devoted. Maybe I should have started praying the prayer on the back immediately (although I had been praying for Philip daily, asking the two Hawaii Blesseds to intercede and heal him), because then I would have known right away that Fr. 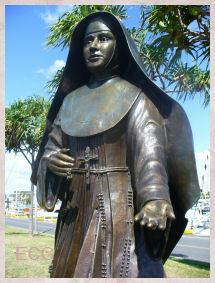 Price was one of the Maryknoll founders! The Maryknoll Fathers hold a very dear place in my family's heart. One need only read a book like The Maryknoll Fathers by Glenn D. Kittler, to know Father Price was a saint. The prayer card will be posted on the side bar. I would ask that you join me in praying the prayer daily for Philip's healing. My sister-in-law shared with me that although my father-in-law has many health problems, he seems to forget his pains and discomforts when she reads to him from Thomas a Kempis' Imitation of Christ. Today she read to him from uniting our sufferings to those of Christ's. I pulled out our Imitation of Christ and opened the book randomly to Chapter 10 About Useless Gossiping. Keep clear, as best you may, from the babel of human voices; it is wonderful what distraction is to be found in the discussion of worldly affairs, even when the motive for it is perfectly innocent. Frivolity is infectious, and makes easy prisoners of us. I wish I had kept silence, this many a time, instead of enjoying the society of my fellow men! What is it that makes us so fond of talking, of gossiping with our friends? We hardly ever come away from it without a guilty conscience. What makes talkers of us, is that we find relaxation, on both sides, in the mere banding of words; we want an escape from the tedious whirligig of our thoughts. We like giving expression to what is in our minds, especially about the good things we enjoy, or would like to enjoy, and the difficulties we find in our way. And the pity of it is that usually it does not good at all; we may get comfort from finding an outlet like that, but it interferes, more than a little, with that inward comfort which is the gift of God. We need more watchfulness, more prayer; our time mustn't be frittered away in doing nothing. When you have leave and leisure of talking, let your talk be such as makes for spiritual profit. Victims as we are of bad habit, unambitious as we are about our souls' progress we speak so unguardedly! And, yet there is talk which can be a great spiritual help to us-I mean, the earnest exchange of ideas about things; especially when two souls, well matched in temper and disposition, find themselves drawn together in God. 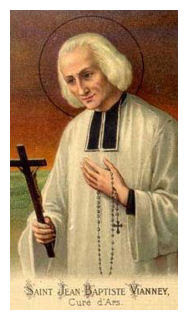 Benedict XVI is proclaiming a Year for Priests on the occasion of the 150th anniversary of the death of St. Jean Marie Vianney, the Curé of Ars. 631 Detach yourself from the goods of the world. Love and practise poverty of spirit: be content with what enables you to live a simple and sober life. Otherwise, you will never be an apostle. 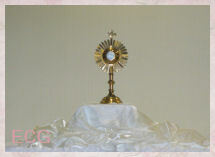 554 Don't omit the visit to the Blessed Sacrament. After your usual vocal prayer, tell Jesus, really present in the Tabernacle, of the cares and worries of your day. And you will receive light and strength for your life as a Christian.